Psathyrella delineata is rather large and stocky, for a Psathyrella. It decomposes the deadwood of hardwoods, growing directly from decaying logs and stumps, and has a corrugated, reddish brown cap hung with partial veil remnants. The corrugated surface of the cap can almost appear reticulate in older specimens. 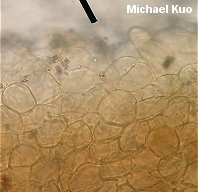 Under the microscope, it features strikingly mucronate cystidia and spores measuring 6.5-9 x 4.5-5.5 µ.
Ecology: Saprobic on the deadwood of hardwoods; growing alone, scattered, gregariously, or in in clusters; summer and fall; widely distributed in North America but apparently rare west of the Rocky Mountains. 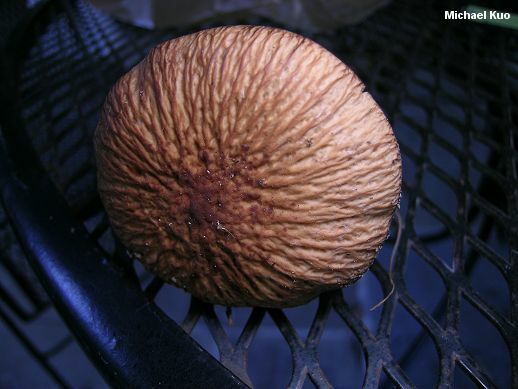 Cap: 3-10 cm; more or less convex at first, expanding to broadly convex or flat; usually finely corrugated and wrinkled, especially in mature caps; sometimes covered with fine fibers when young; dark reddish brown to brown, fading to brownish or tan; the margin typically hung with whitish partial veil remnants. Gills: Attached to the stem; close; pale brownish at first, becoming dark brown. 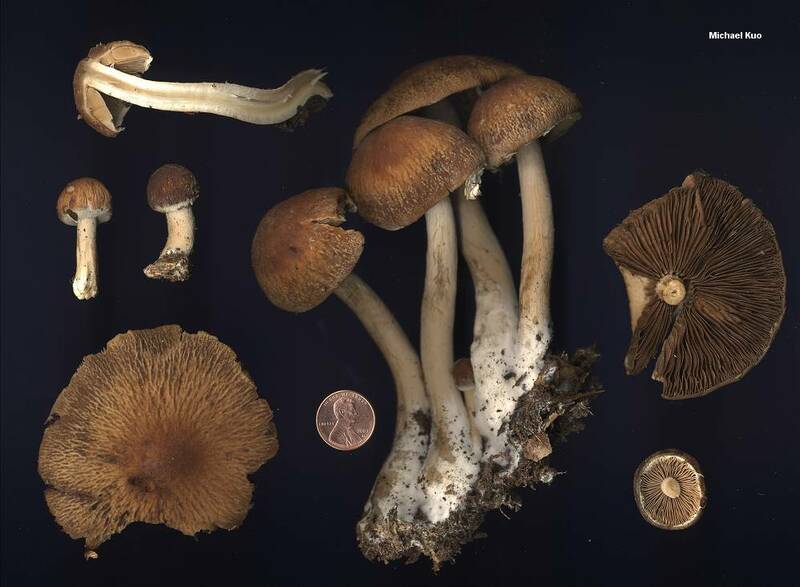 Stem: 6-10 cm long; 0.5-1.5 cm thick; more or less equal; whitish; hollowing; smooth or finely silky; almost always lacking a true ring, but sometimes with loosely clinging partial veil remnants; basal mycelium white and copious. Flesh: Thin; fragile; watery brownish to whitish. Chemical Reactions: KOH on cap surface negative to grayish. Spore Print: Purplish brown to purplish black. 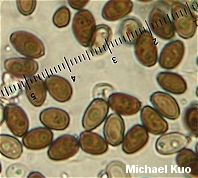 Microscopic Features: Spores 6.5-9 x 4.5-5.5 µ; ellipsoid; smooth; with an inconspicuous pore but not substantially truncated; brown in KOH. 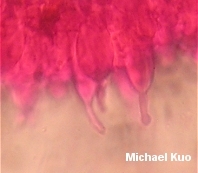 Pleurocystidia to about 100 x 25 µ; hyaline in KOH; thin-walled; mucronate to subclavate or subfusiform, with prominent, fingerlike mucros. 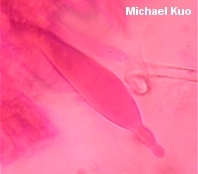 Cheilocystidia similar. Pileipellis hymeniform-cellular. REFERENCES: (Peck, 1911) Smith, 1941. (Saccardo, 1925; Smith, 1972; Smith, Smith & Weber, 1979; Phillips, 1991/2005; Lincoff, 1992; Barron, 1999; Roody, 2003.) Herb. Kuo 10020302, 10091003.